JT's Strong Arm Jack Stabilizers stop the rocking!! These innovative bars virtually eliminate all unwanted movement using race car suspension technology and the power of triangulation. 5th Wheel or Travel Trailers sway with side-to-side movement even when parked, chocked and leveled. This is due to play in the springs and shackles that mount the suspension to the frame along with play in the tires. 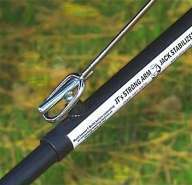 Using a unique system of brackets, the Strong Arm attaches to any of the three main types of jacks found on RVs: scissor, electric and telescoping. 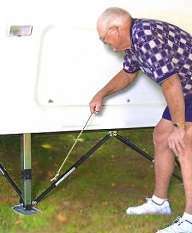 One end of the Strong Arm easily attaches to a leveling jack and the other end to the RV frame. When parked, the Strong Arm telescopes into place as the jacks are lowered and the RV is leveled. An easy twist of the Strong Arm's handle locks it in place, virtually eliminating ALL side-to-side and front-to-back movement. Easy to set-up: telescopes into place when jacks are lowered, all you do is tighten the "T-Handles"! Each set contains 6 Strong Arm stabilizer bars, and associated mounting hardware. Some Drilling is required. Note: Kit # 15-0359 is for 5th Wheels with less than 58" between electric landing jacks. Please visit the manufacturer's website for further information and Installation Instruction downloads. A Handy Accessory - Order the 'T-Handler' to make it easy to operate the T handles without a lot of bending or crawling. NOTE: This product comes in GRAY color only.